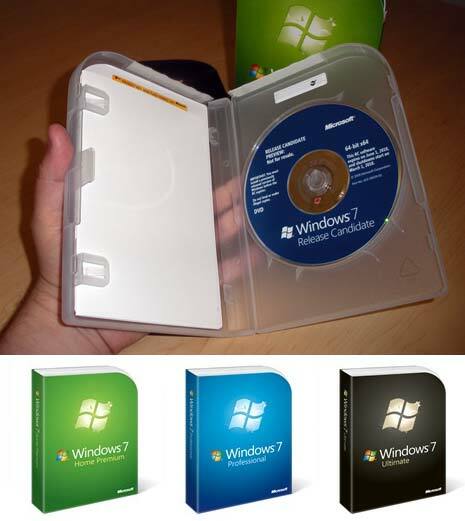 Microsoft has unveiled all new and simple packaging for Windows 7 operating system media disc. Whole packaging is simple, easy to open and enviornment friendly. Cover has big bold Windows 7 logo with clearly marked version of Windows 7 among professional, ultimate etc. No more trying to figure out ways to tear open CD packaging. Windows 7 comes with easy to open plastic case cover. Open it like standard DVD case and grab your Windows 7 disc. It is accompanied by a paper sleeve and simple getting started guide. As pointed by official source, “… The plastic case protecting the Windows 7 disk is lighter and is recyclable. The packaging itself has a 37% weight reduction and the econometrics score has improved by 50% over it’s predecessor.” Not bad, another positive for Windows 7 !